Singapore Gin Sling, Blood and Sand and the Aviation wouldn’t be the same without them. They are brilliant in pies, go great with pork dishes and may even be a super food able to combat insomnia. But cherries in cocktails are also horribly abused, few things taste worse than artificial cherry aroma and the description of how most maraschino cherries are made can make you sick to your stomach. 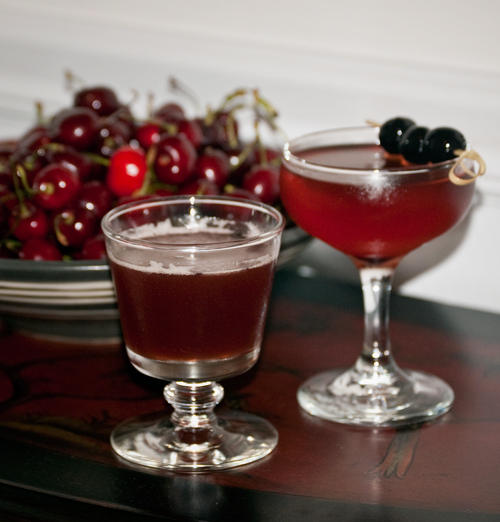 So it’s my pleasure as the host of Mixology Monday number 74 to challenge you to honor the humble cherry. I had just tried some sour cherry jam in a Young Frankenstein cocktail, What Hump?, and thought I might start there, but honestly I got tired of the straining after shaking that this involved. Also, not wanting to just rely on the old standby Cherry Heering, I played a bit with Leopold Bros. Michigan Tart Cherry Liqueur and a Black Forest Cherry Liqueur, and, although I like these quite a bit, in the end it was the Cherry Heering that won out in my two cherry cocktail creations. Stir with ice and strain into coupe. Garnish with three maraschino cherries. If I was doing cherries, I was going all out. Although tempted to have two cherry components and go with a Neil Diamond reference (anyone?) I ended with three cherry components representing a slot machine’s payout. The sweetness here obviously comes from the Cherry Heering, though the bitters also offer more sweetness and tartness than they do anything bitter. The cherry brandy makes the cherry flavor a little more natural to my taste, and opens the drink up a bit, as does the gin, which adds some nice spice and herbaceous notes. For the second drink, I wanted a punch that would really contrast with the sweetness of the cherries. Thus, the Backhanded Compliment. I love the spiciness of rye, and the black pepper infusion here enhances that even more. There’s a lot of Cherry Heering present for sweetness, but the amount of spice along with the tart acid of the lime really help to balance it. The Peychaud’s I think deepens the drink a little more, while also adding to its bite. 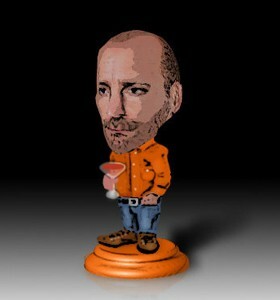 Maybe if the theme is ever pop icons of the 60’s and 70’s I can go back to that Neil Diamond tipple.